Book Review: 100 Under $100: One Hundred Tools for Empowering Global Women by Betsy Teutsch. So often, we feel powerless to help those most in need. We feel that our help is insignificant in the grand scheme of things: when a problem is so large--what can one person do? It seems that when faced with world issues, such as extreme poverty, we are sometimes so overwhelmed by the needs that we are not even sure where to begin. In reality, there are so many ways to help our world's poverty stricken populations by empowering the women at the heart of those populations. 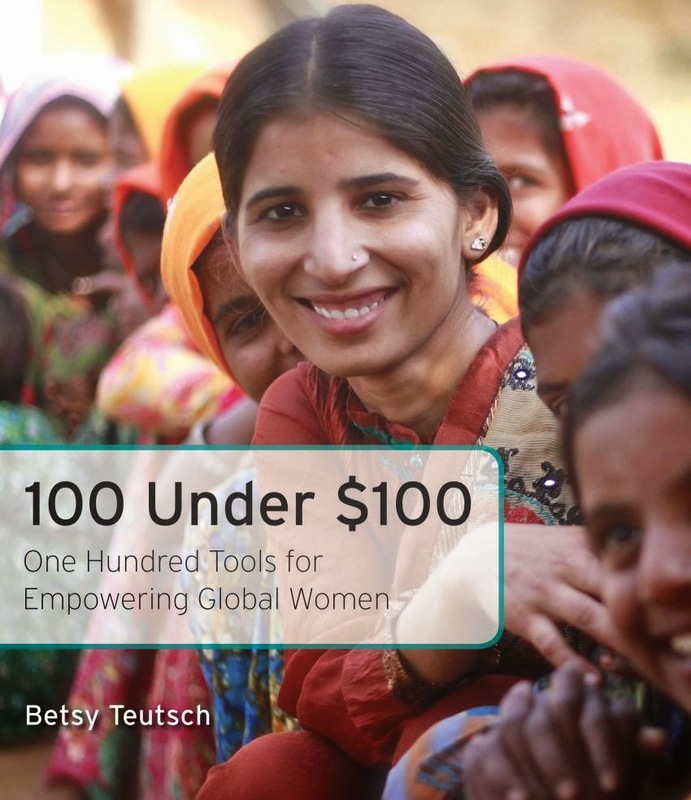 As a member of the Social Good Moms' Global Team of 200--I recently had the opportunity to read and review 100 Under $100: One Hundred Tools for Empowering Global Women, an incredible book from author Betsy Teutsch. I am very excited to share this amazing book with you! 100 Under $100 is an eye-opening, inspiring resource. 100 Under $100 is one of the most well-researched, easy to use, compilations of aid organizations and social good projects that I have ever seen. The author offers over 100 ways in which YOU can support projects around the world. Her suggestions concern vital health, construction, energy, water & sanitation, domestic technology, education, information & communications technology, subsistence farming, financial, legal and transportation needs. 100 Under $100 is such an eye opening book! So often, we fail to realize the levels of extreme poverty and the lack of even basic needs of our world's people--especially women and children. The author has chosen small projects, with small price tags--under $100; which provide a large impact for the dollar! 100 Under $100 is such a well-researched resource. I love the format of this book. The author provides information about a basic need--such as her chapter about domestic technology--and then offers pages of resources to improve that area of life in poor areas of the world. She references groups and products working on specific technology or projects related to helping with specific areas of the topics--and gives ways for your to get involved or ways to educate others. Would I recommend 100 Under $100? This book is the perfect starting point for individuals, families, businesses, and students--anyone--seeking affordable and suitable social good projects and endeavors. My daughter used this book often while working on a recent Model UN project and is looking to support a few of these projects and programs as well. I think this book is an absolute must-have to anyone involved (or seeking to become involved) in social good efforts. 100 Under $100: One Hundred Tools for Empowering Global Women make it so easy for readers to identify areas of need, research projects of interest, contact organizations and program coordinators and find valuable ways to get involved! Teutsch will also be donating a life-saving dose of Misoprostol (to Life For African Mothers) for each book sold. About The Author: Betsy Teutsch is passionate about mobilizing resources for the world’s poorest women. She has pursued Encore Careers as blogger, columnist, community organizer, and eco-activist. In addition to her successful career as Judaica artist, she served as Communications Director of GreenMicrofinance, promoting affordable paths out of rural poverty. She is a founding Board Member of the award-winning Shining Hope for Communities and the Kibera School for Girls. Teutsch launched three local chapters of Dining For Women, a national network of giving circles supporting women’s grassroots initiatives. Teutsch contributed extensively, based on research from her book, to the Atlantic’s series What Works: Straightforward Solutions to Complex Problems. Married to Dr. David Teutsch, she just welcomed her first grandchild. She’s a Fargo, ND, native and lives in Philadelphia, PA. I received an advanced release copy of this book for use in my review as a member of Social Good Moms' Global Team of 200. All opinions and experiences with this book are my own.